Ranch of the Running Bears is a place where cattlemen and cowboys once roamed and settlers made their livelihood from the land. 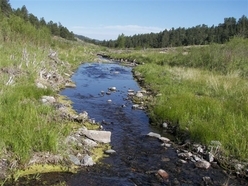 Step back in time as you cross over the year-round Current Creek which flows along the northern portion of property. Near a quiet aspen grove rests an original one-room log cabin reminiscent of the early days. It has been quaintly furnished with a wood burning stove and a sitting area with games and books still enjoyed today. Aside the cabin is a refurbished dug-out root cellar. As you continue through the ranch you pass by Dicks Creek which feeds a small pond and waterfall. 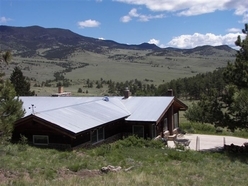 A 2096 SF mountain home awaits you in the southwest area of the ranch. This home offers a warm western style welcome with its vaulted timber beam ceilings and tongue & groove walls. Its cozy kitchen has a rustic style woodstove, new countertops, wood laminate floors and corner windows. Enjoy the open floor plan and the impressive natural stone wood-burning fireplace and game room. The windows frame the sweeping mountain vistas and thousands of acres of pristine mountain scenery – it is a blend of open meadows and timbered clusters of pines and scattered aspens. Wildlife includes elk, mule deer, turkey, and, of course, those occasional running bears! 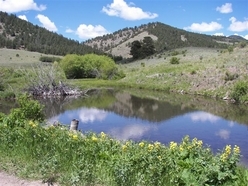 The ranch is meant for hunting, horseback riding, grazing stock or exploring by ATV or foot. It is fully fenced and operates on solar and propane energy. Other improvements include detached 2-car garage with oil pit and large shop, loafing shed and outdoor corral. Ranch of the Running Bears gives you a modern day opportunity to experience the legendary days of the old west!